This blog post is a bit delayed, but we finally have some new floors to rave about! Years after moving - far more than expected - we finally ditched the old teal green carpeting and now have some wonderful stained floors in the home. With the help of our friends at Green Home Experts, we tried several different color samples of a product called Rubio Monocoat. This is a single-application floor stain and finish that does a fantastic job of making the floors in our house pop like never before. Best of all, the product doesn't have any noxious off-gassing like traditional polyurethane, and it has no harmful chemicals. We went with Rubio's color "Black." I know what you're thinking, "Who wants black floors?!?" but the reality is this doesn't paint the entire floor black, it ends up staining the wood grain black and the surface of the wood a rich dark color. Just see the closeup on Rubio's web site to see what I'm talking about. 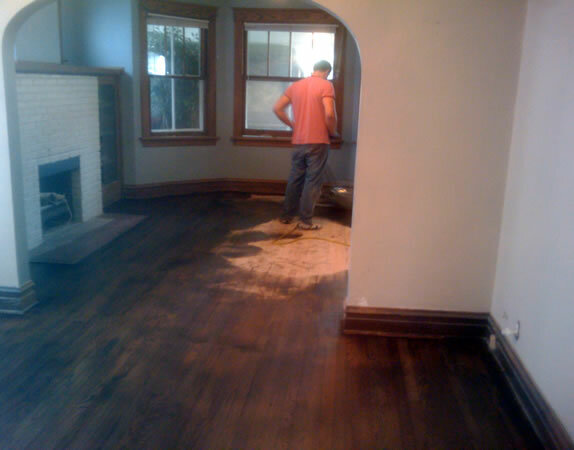 The oil was applied by hand along the room edge and then with a floor buffer throughout the rest of the floor to give a nice finish. Working with the product is a little different as you need to work in an area within 15 minutes so the oil doesn't dry too much. But there is just one application of the oil that is needed. Usually there are no repeat visits, but we learned a lesson on this. You see, the paint turned out so nice in the Living Room that we decided to the Dining room too after the floors were done. Learn your lesson here from our mistake: No matter what you do and how tempted you are, wait until EVERYTHING else is done before finishing floors. Because Rubio Monocoat is a natural oil it takes a while to dry. It needs 36 hours of drytime to be walkable, and three weeks to fully cure and dry out. The painting and sanding required in the dining room ended up getting dust into the crevices of the not-quite-dried floors, resulting in a hazy finish. But a few drops of oil on a floor buffer corrected the issue. The bad part is it required another 36 dry time and cure time. Overall though we are quite happy with the way things turned out. In fact the color matched the floor trim very well, and made the built-in trim and mantel appear a bit too muted, so I grabbed an old cloth and some linseed oil and cleaned up the existing wood too so everything now has a nice rich luster. I also debated stripping the old paint off the fireplace, but time is a luxury right now, so we put a coat of a nice rich gray over the painfully boring white, which blends in nicely with the new green-blue walls and dark floors. And, until some other thing strikes our fancy, I think we can call this room "done!" For the time being. We had long ago removed an air duct due to structural concerns, but never patched the hole. We never were able to insulate above/below the bay windows (finished a day ago). The floors turned out to be in great shape, and before the final coat was applied, we had Sustain-a-building come back and repair the walls and ceiling, patch, prime, and paint them. Deciding on paint was an interesting experiment that involved many trips to our local Benjamin Moore store for samples. It was interesting to learn that they are slowly phasing out all high-VOC paints, so all of their paints for indoor use will soon be low or zero-VOC. We will be using the Benjamin Moore Natura line which is zero-VOC paint to keep our indoor air healthy, especially with a pregnant woman in the house. 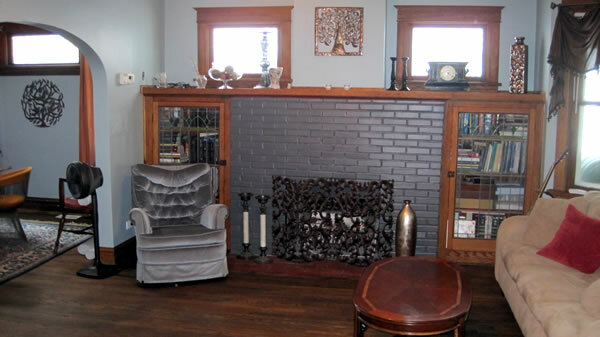 But we eventually settled on a color called Silver Minx for the walls in the Living Room. Brandon's crew came and did some great work, and painted the ceiling a flat white, the ceiling trim (already painted) a semi-gloss white, and the walls the green/blue. Someday it would be nice to strip the crown molding in this room down to the original wood and refinish it, but now is not the time so we reluctantly added another layer of paint to it. The wall paint color is interesting - it appears light blue in daylight, but changes to light green at night. Pretty neat. In this last photo, you can compare the wall on the left with the first photo in this post above and see that the gaping hole where an air duct used to be is now patched in. I actually spent an evening using SOY-Gel stripper , a nice product that performed well. I had some pieces of matching trim from the old kitchen in the garage (thank god I saved them). One coat of the stripper and a few hours later, the layers of paint easily came off. It still took a fair amount of time to scrape the boards in detail and clean them to be stained, but this made patching the wood where the air duct used to be pretty easy for the Sustain-a-building crew. At long last, the Living Room is ready for the finish flooring. Yes, getting ready for baby is in full swing here at Humphrey House, which means any activity that may cause or contribute to creating dust needs to be done NOW before baby comes and is soon crawling around licking the floors. So the next rooms on our whirlwind finishing of Humphrey House is to tackle the Living Room and Dining Room. Sustain-a-building came out and helped us once again by insulating the walls with blown-in cellulose above and below the massive 10-foot wide bay window in the living room. This area always gets so cold in winter time and having something in the walls other than the dead air space that has been there for the last 100 years will certainly help. In the photo below, you can see the holes cored to blow in the cellulose insulation above and below the bay windows, and also Cosmo kitty saying goodbye to carpet. 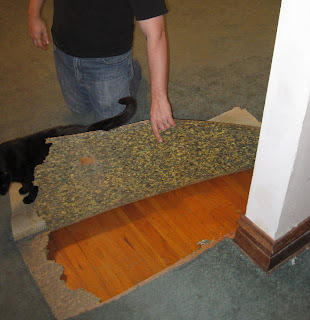 The carpet that the home's PO had installed before we moved in finally had to go. We have effectively treated this carpet like a dropcloth for years, knowing that someday we would be taking it up and refinishing the beautiful hardwood floors beneath. Well, no time like the present! Pulling up a seam in a high traffic area near the hallway, we found that the floors underneath look to be in remarkably good condition. I expected to find a clawed, scratched floor similar to the maple that was in the kitchen, but no, these were in great shape. Oh well, we had already decided to sand them down anyway, so out with the old! Once the old surface was sanded, we got to see some gorgeous graining in the floors. These are super nice and we are very fortunate to have them in such good condition after a century. It looked like this was just the first time they had been sanded too! Hopefully you get an idea of the grain from the closeup below (Bonus points for anyone who IDs the book Jen chose to block off the heat duct). The grain will show up nicely as we're planning on a dark finish of Rubio Monocoat, a product which actually penetrates and bonds with the wood to create a durable surface. From the manufacturer, "Monocoat all-natural oil wood floor finishes are plant-based, VOC-free and completely non-toxic oil finishes of extraordinary durability." But first, we need to have Sustain-a-building come and paint! Working in the field of green homes is both a blessing and a bit of a curse. 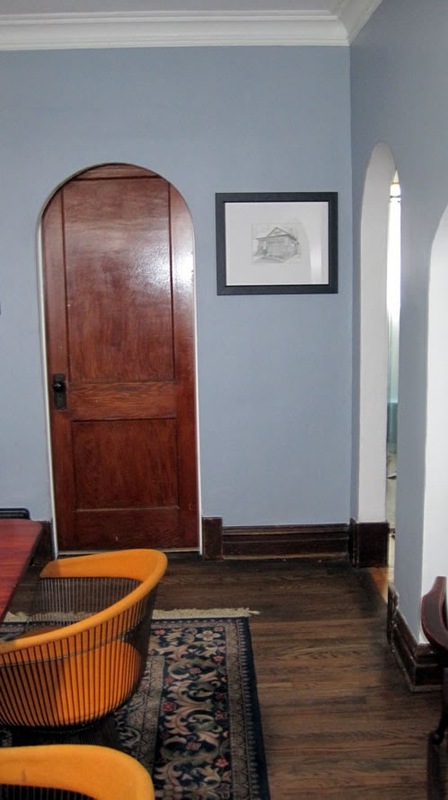 It's great to establish contacts with people that understand healthy indoor air and energy efficiency, but when you live in a 1920's house you realize there are a lot of improvements that can be made. One thing we had done a few years ago when we finished our second floor was install some storm windows on the original windows in the master bedroom as I really liked the vintage glass and look. The storm windows helped a bit, but after several winters sleeping next to this cold surface, it quickly became apparent that we had to look for something that would perform better and be more comfortable for us. Especially since the windows take up the majority of the wall. So not only did we want comfort, but if I was going to buy windows, I want the best performing windows I can get while still keeping the historic look of the front facade of our home. I spoke with Andy Scott from Energistics, who is both an energy rater (building science specialist) as well as a distributor for Serious Windows,. Who better to advise than someone who has the tools and training to make informed decisions about building performance? Andy helped me get the remodel-friendly and affordable vinyl option (Series 501) with mullions that divide the top sash into three panes of glass to help keep the historic look. What makes these windows particularly good is a suspended film in the glass that helps reflect back unwanted heat from the sun - an important issue that is usually difficult to control for West-facing windows receiving afternoon heat. The windows have a U-value of 0.21, which means there R-value is 4.75 (1 divided by U-value = R-value). Even though they are vinyl, the frames are very well insulated (rare for vinyl windows). This is very good for a window. Since we were adding windows, I also had Sustain-a-building install these windows. When removing the old windows, they took advantage of the work to dense-pack cellulose above and below the windows to help keep the room even more comfortable. It still amazes me that most homes built in the 1920's do not have insulation - energy must have been very cheap back then! Before installing trim, the guys used Great Stuff Window And Door Foam around the seams to ensure a good airtight seal. The trim pretty much consists of 1 x 4's. The top casing piece has a small bullnose addition that wraps the 1x4, and then the addition of a crown molding piece above. A flat 1x3 caps off the crown for the finished look. And the result if we take a step back in the room and admire the work? Absolutely stunning. We may not even get curtains (just shades) since this looks so good! From outside, the windows are bit brighter than the "Craftsman tan" paint we used on the windows on the front porch so they do jump out a bit. I haven't yet decided if its worth painting the new vinyl to match or not, but for now its much better than the older brown that just looked like the windows faded into a black hole. The view from the street certainly looks much better, and I know we're going to be very comfortable next winter thanks to our Serious Windows! 'Bout Time you Finished Those Windows! Windows (and more specifically, window trim) has been one of the luxuries we were willing to live without when we finished our second floor a few years ago. We always intended to do it, but we just needed to move upstairs first. Then, a few years passed. There's nothing like a deadline to get things done though, is there? Beginning with the nursery, we finally got some trim going. The first step was staining the windows themselves. This was much more difficult than I had expected, and took nearly an entire day to stain and then use 2 coats of sealer. So many small parts and angles! Of course, we used Water-based stain and sealer as they have much less emissions, and okay for Jen to breathe. We definitely needed help with this and other projects we'll be posting about soon, so I called on my good friend and one of Chicagoland's leading Green builders, Brandon Weiss of Sustain-a-building to help us get things done in a quality, sustainable manner. His expert carpenter made quick work of the window trim, which needed a bit extra detail in the form of a 3/8" jamb extension. Want to contact us at Humphrey House? Email us at jay(at)humphrey-house.com - we'd love to hear from you. This work by http://wwww.humphrey-house.com is licensed under a Creative Commons Attribution 3.0 United States License.